— Longtime CNN host Larry King on NewsmaxTV’s The Steve Malzberg Show, February 12, 2014. — MSNBC President Phil Griffin in a January 30 interview with The Daily Beast’s Lloyd Grove. — ABC News anchor Diane Sawyer in an interview for the February 2014 edition of Ladies’ Home Journal. — New York Times Executive Editor Jill Abramson talking about her newspaper’s political slant in an interview with the New Republic’s Michael Kinsley, August 20, 2013. — Former NBC News reporter and New York Times columnist Bob Herbert on MSNBC’s Melissa Harris-Perry, April 27, 2013. — NBC Nightly News anchor Brian Williams on Alec Baldwin’s Here’s the Thing New York City radio show, March 4, 2013. — NBC political director Chuck Todd on MSNBC’s Morning Joe, February 19, 2013, talking about why so few conservative members of Congress are willing to go on liberal talk shows. — Ex-CBS Evening News anchor Dan Rather on Comedy Central’s The Daily Show, May 30, 2012. — Co-host Barbara Walters on ABC’s The View, April 9, 2012. — Exchange during the New York Times “Freakonomics” radio podcast, February 16, 2012. 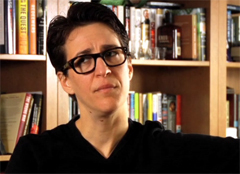 — MSNBC 9pm ET host Rachel Maddow in a December 21, 2011 interview posted at Slate.com. — New York Times Executive Editor Jill Abramson on NPR’s Diane Rehm Show, October 19, 2011. — Exchange on CNN’s Piers Morgan Tonight, June 22, 2011. — NPR’s On the Media host Brooke Gladstone in an interview with CNN.com’s “In the Arena” blog posted May 31, 2011. 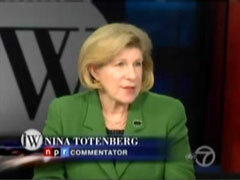 — Talking about a hidden camera expose of NPR on Inside Washington, March 11, 2011. — MSNBC’s Chris Matthews in an interview with local Washington, D.C. host Carol Joynt, as quoted by Politico’s Patrick Gavin in a December 9, 2010 article. — NBC Nightly News anchor Brian Williams to presenter Matt Frei during the BBC’s Americana podcast, March 28, 2010. — Former New York Times Executive Editor Howell Raines in a March 14, 2010 op-ed for the Washington Post. "I ask people just to look at my body of work. And nobody knows my biases. Do they think I'm against? Do they think I'm for? They don't know my biases. They don't know where I come from in this. I just try very hard to report the facts and to tell the stories as best as I can. I am not part of the current crop of opinion journalists or commentary journalists or feelings journalists. I strongly believe that I have to remain in the realm of fact." — CNN's Christiane Amanpour to CBS's Lesley Stahl in a June 23, 2009 'Women on the Web' interview. "Even though independent reports have shown the media was more critical of Barack Obama than John McCain during the presidential contest, there is still a fantasy that the press is gaga over now-President Obama." — MSNBC's David Shuster on 1600 Pennsylvania Avenue, March 23, 2009. CNN's John Roberts: "But if you disagreed with some of his [John McCain's] policies, why were you out there on the campaign trail supporting him?" Joe 'the Plumber' Wurzelbacher: "Do you agree with every candidate and your candidate's policies?" Roberts: "Hey, I'm not out there stumping for anybody, I'm a journalist." — Exchange on CNN's American Morning, December 23, 2008. "Media bias largely unseen in U.S. presidential race"
— Headline over November 6, 2008 Reuters dispatch claiming no liberal tilt in favor of Barack Obama. "Yes, in the closing weeks of this election, John McCain and Sarah Palin are getting hosed in the press, and at Politico....We'd take an educated guess — nothing so scientific as a Pew study — that Obama will win the votes of probably 80 percent or more of journalists covering the 2008 election....[But] of the factors driving coverage of this election...ideological favoritism ranks virtually nil." — The Politico co-founders John Harris and Jim VandeHei in their October 28, 2008 column, "Why McCain is getting hosed in the press." "Before Gov. Sarah Palin came flying in from the wilds of Alaska for the Republican convention in St. Paul, there was a lot of sniggering in media rooms and satellite trucks about her beauty queen looks and rustic hobbies....In the press galleries at the convention, journalists wrinkled their noses in disgust when Piper, Ms. Palin's youngest daughter, was filmed kitty-licking her baby brother's hair into place." — New York Times media writer David Carr, September 7, 2008. "Hell no! I'm dying to find another liberal [to] open their mouths. Where are they!" — Former UPI White House correspondent Helen Thomas, when asked if she thinks most White House reporters are liberal, as reported by The Washington Examiner's Jeff Dufour and Patrick Gavin, July 21, 2008. "While I would not dispute the longstanding assertions that there are more political liberals in newsrooms than conservatives, our political staff, as best I can tell, represents all kinds of backgrounds and beliefs, and because we all work so closely and in such a fishbowl, we all tend to keep one another on the straight and narrow." — New York Times political editor Richard Stevenson during an online chat with readers, June 23, 2008. "It was no secret to the reporters around me that I have Democratic-leaning views. But they said I was always fair." — Former ABC and CBS reporter Linda Douglass after she became a spokeswoman for Barack Obama, as quoted by the Washington Post's Howard Kurtz in a June 16, 2008 profile. "We are agnostic as to where a story may lead; we do not go into a story with an agenda or a pre-conceived notion. We do not manipulate or hide facts to advance an agenda. We strive to preserve our independence from political and economic interests, including our own advertisers. We do not work in the service of a party, or an industry, or even a country. When there are competing views of a situation, we aim to reflect them as clearly and fairly as we can." — New York Times Executive Editor Bill Keller in his Hugo Young Memorial Lecture in London, printed in Britain's The Guardian newspaper on November 29, 2007.